Rock the Bells Line-Up Announced! The Rock the Bells line-up was finally released last night and it looks as though it will easily rival the performances of the past. Many old faces return including Nas, Lauren Hill, Cypress Hill, Blackstar (Talib Kweli and Mos Def), many members of the Wu-Tang clan, Immortal Technique and Slaughterhouse. There are also quite a few new artists, two that I’m particularly excited to see are Mac Miller and Childish Gambino. Also remember, when the announced last years line-up it was missing two the years biggest acts (Snoop Dogg and Tribe Called Quest). We can only hope that this year will be much the same. Bonnaroo’s line-up is extensive but this year they are including a handful of the biggest names in hip-hop including: Eminem, Lil Wayne, Big Boi, Wiz Khalifa and J. Cole. I don’t even know the majority of the music but they’ve got enough big names to make me interested and plenty of new artists and genres to capture my attention. I’d absolutely love to go to this festival…lets see if I have 250 bucks lying around any time soon… BONNAROO 2011 TICKETS ON-SALE SATURDAY, FEBRUARY 19th, 2011 AT 12:00 PM EST. Sometimes people talk and sometimes what they say is true, other times its a bunch of hogwash. 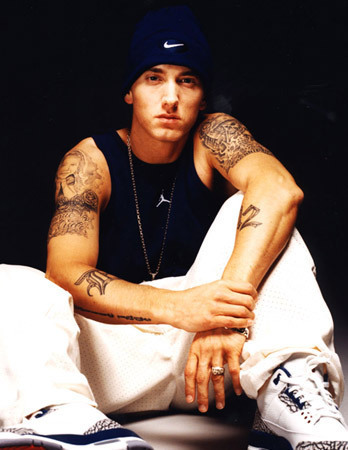 Right now Fakeshoredrive is reporting that Eminem might possibly headline at Lollapalooza 2011. While i’d like to believe this, something tells me its probably a bunch of hot air, because Em rarely plays shows for the public and rarely plays festivals. Until the complete lineup is released in April I wouldn’t take this for fact, but keep an eye and an ear out! Update: Eminem is confirmed along with Foo Fighters and Muse. 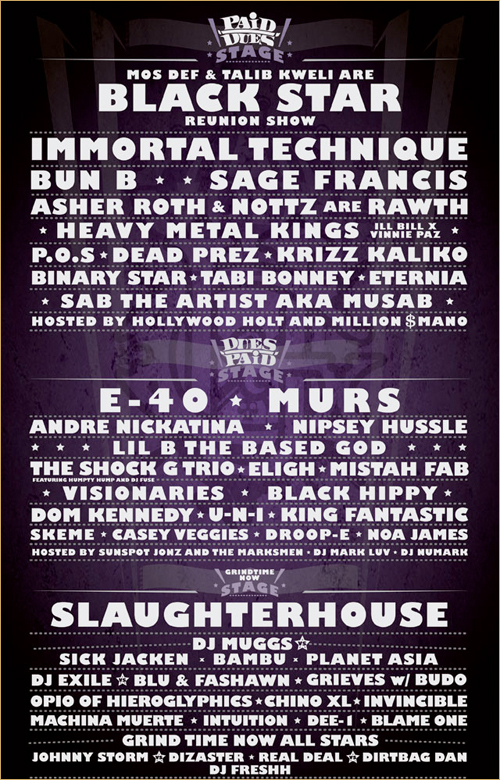 This years Paid Dues lineup has been announced and I am infinitely disappointed that I won’t be able to make it back to the golden state to witness it. With a lineup of Mos Def & Talib Kweli (as Blackstar), Immortal Technique, Sage Francis, Asher Roth & Nottz, E-40, Murs, Andre Nickatina, Nipsey Hussle and one of my personal favorites Slaughterhouse. The show will certainly be one to be remembered. The Show is in San Bernardino, CA. Cop the tickets online here.